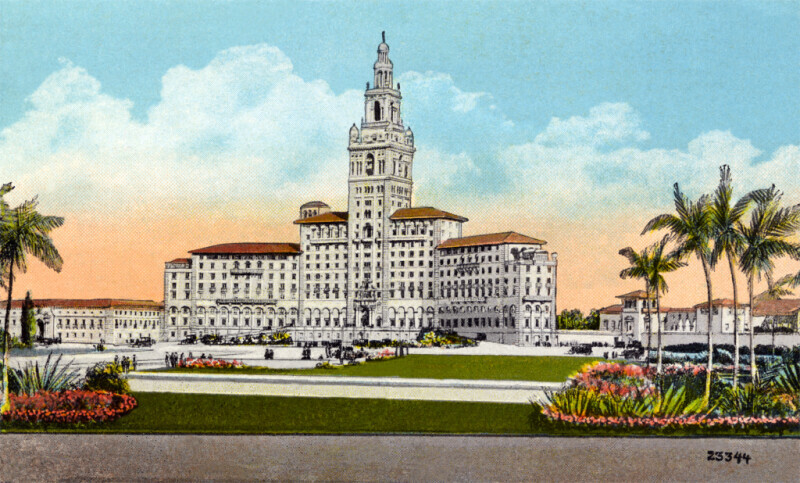 This image shows the Biltmore Hotel in Coral Gables, Florida. The building was constructed of concrete, faced with stucco, in the Spanish Colonial Revival style. The roof is covered with terracotta tiles, The main feature of the hotel is the central tower, which includes turrets and a cupola. The grounds are landscaped, with lush grass, palm trees, and flowering plants. This building is on the National Register of Historic Places, and is a National Historic Landmark.